We are in a great time of combining the power of new media with human ingenuity, spirit and heart to achieve remarkable results in saving dogs. There are pioneers creating and shaping a wonderful, promising future: a 13 year-old Romanian girl who has saved over 150 dogs and placed them in countries such as Belgium, Germany and Austria (Facebook), a Maryland woman who has enlisted over 200 people in just three days to save her dog (crowdfunding), and a team of veterans who save injured military working dogs that would otherwise be euthanized (a mixture of online tools). With new media, these people and many others are making a lot of dogs happy. 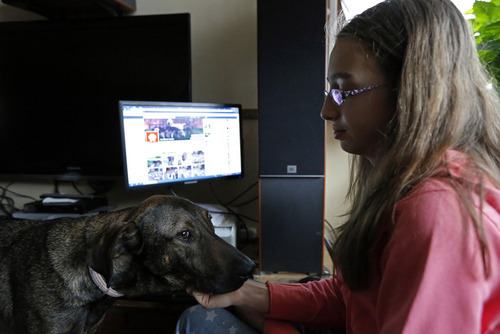 Ana-Maria Ciulcu, a 13 year-old in Bucharest, is using Facebook and her resourcefulness to find forever homes for stray dogs that otherwise would be caught and euthanized by the city’s animal control services. Bucharest is suffering from a rampant epidemic of stray dogs dating back to its days under dictator Nicolae Ceausescu. With support from her family and a veterinarian, Ana-Maria has rescued over 150 dogs and arranged happy homes for them all over Europe via her bustling Facebook page. Glenda Mosner, a Maryland woman, was introduced to a young English bull pup named Munster after he was diagnosed with spina bifida and his original owner just couldn’t accept a veterinarian’s recommendation to euthanize him. Glenda adopted Munster and through her online know-how, recently raised over $5,000 through crowdfunding in just three days to pay for his medical bills, and along the way built a thriving community of dog lovers who follow Munster’s every move and offer all kinds of support. Danny Scheurer, an Army and Marine Corps veteran, leads the Illinois-based Save-A-Vet team, which employs a variety of new media tools from social networking to crowdfunding to even specialized e-commerce programs such as AmazonSmile to provide funds and adoption services for injured Military and Law Enforcement Working Dogs (and that otherwise could be considered un-adoptable and be euthanized). Save-A-Vet operates properties in six states with funds derived 100% through donations, largely driven through new media. Led by new media pioneers like these, we are now starting a new joyful, happy era helping people change not only the way we save dogs but the way we see dogs… isn’t that a great beginning?